Every one of us has a seed story. For some of us it is elementary school where we learned about germination by growing bean seeds in dixie cups. Many gardeners however have a much deeper, personal connection to seeds by growing and saving seeds that were shared with them by a parent, grandparent or close friend. To them that bean or okra is much more than a plant or ingredient in a delicious summer meal but a connection to the legacy of that plant. Just like each one of us has a story and history every variety of seed has a story to share. And the seeds with the most interesting stories tend to be the ones with the most history. Some varieties can be linked to important historical figures like Thomas Jefferson. Others bring attention to average gardeners who became stewards of lost varieties like Mr. Merle Van Doren of Missouri who had been growing the “Moon and Stars” variety of watermelon that was believed to be lost until he wrote a letter to the Seed Savers Exchange in 1977. As the growing season for much of our summer favorites comes to an end I would encourage you to consider saving seeds from some of your healthier more vigorous producers and begin a seed legacy of your own. Here are a few key things to keep in mind when saving seed. When saving seed, make sure that they are open pollinated varieties and not hybrids. Hybrids are products of cross breeding of two different varieties. Hybrid plants, often misunderstood as genetically modified, are bred for combinations like vigor, taste, disease resistance, or productivity. Hybrid plants like ‘Beefmaster’ tomato will produce a viable seed but the plants that grow from the seeds will not be reliably similar to their parent. Tomatoes, peppers, beans, and okra are great plants for the first time seed saver. These plants have flowers that are self-pollinating and seeds require little or no special treatment before storage. Seeds from biennial crops such as carrots or turnips are harder to save because the plants need two growing seasons to set seed. Plants with separate male and female flowers like corn or vine crops, may cross-pollinate, making it difficult to maintain seed purity. Corn is wind pollinated and a stand of sweet corn can be pollinated by a popcorn variety from a neighbor up to a mile or more away. Cucumbers, melons, squash and gourds are insect pollinated and because they belong to the same family, Cucurbitaceae, they can cross-pollinate if grown in close proximity. This cross-pollination will not affect the fruit this season but the resulting seed will often have off characteristics or flavor. Once you have identified open-pollinated crops, make sure to select the most vigorous plants for next year’s seed. Do not save seed from weak or diseased plants. Some plant diseases can carry over into next year through the seed. Bean and okra are easy to save seeds as you simply allow the pods to fully ripen and dry on the plant. This is usually about a month after the point that you would normally harvest for eating. If you want to shell them to save the seeds it is best to allow them to dry indoors for two weeks. Many people will leave the seeds in the pods until next year. Tomato seeds are easy to save but do require a little work. Allow the fruits to fully ripen then scrape the seeds out along with the mucous into a glass jar with some water. The mixture of water, mucous and seeds will begin to ferment in a few days which will separate the seeds from the mucous coating. Stir or swirl the jar a couple times per day and the seeds should sink to the bottom within five days. 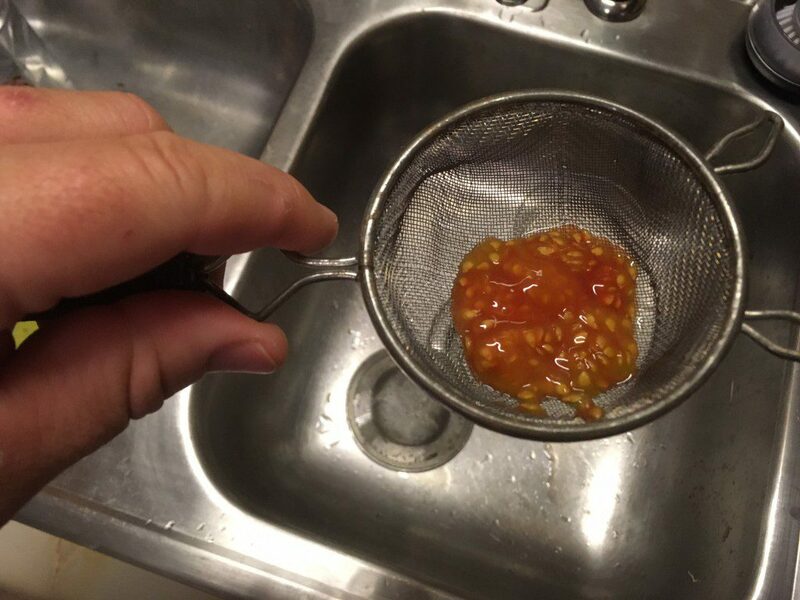 Pour the liquid out, rinse the seeds then spread them out to dry on a paper towel. Tomatoes need a fermentation process to separate the seed from the mucous. Start by scooping out a bunch of seeds into a glass jar. After the seeds go in the jar add enough water to cover the seeds. 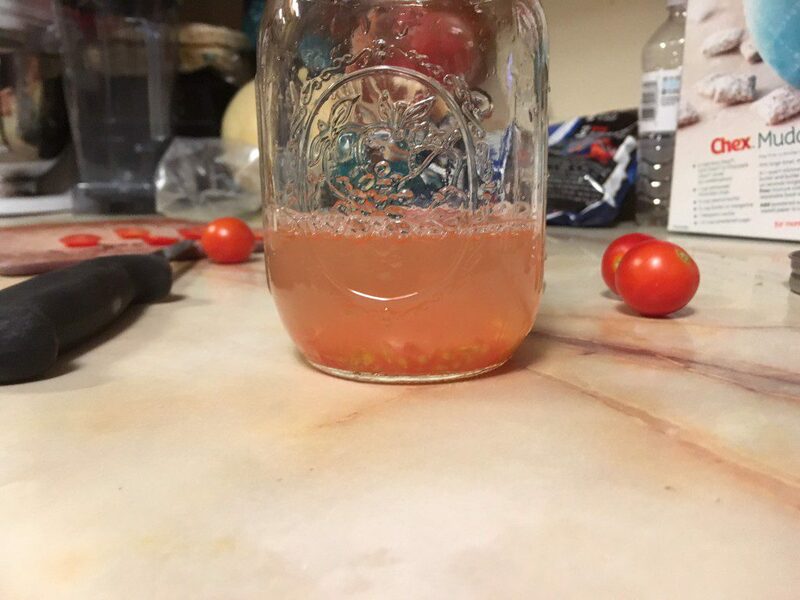 In about 2 days the fermentation process should begin, stir or shake the jar a couple times a day and by about day 4 the seeds should be ready to pour out and dry on a paper plate. Dryness and cool temperatures are key in keeping seeds viable. Store seeds in paper envelops inside of an airtight container or jar. A small amount of silica-gel desiccant added to the container will help keep seeds dry. Refrigeration between 32 to 41 degrees is ideal. And be sure to label your saved seeds with things like name, variety and date of collection. Posted in Organic Gardening, Seed Library, Seed Saving, Tomato, Vegetables. This entry was tagged Seed Garden, Seed Saving, seeds. Bookmark the permalink.